Owning and maintaining a pool is no easy task. If you’re looking to update your pool, there are numerous resources to help you save money in the process. Knowing when to save money and when to invest more is key to making the best upgrades to your pool at the most reasonable price. The average cost to repair an entire pool is right around $8,000. Depending on which one of the many pool components need replacement or upgrading, these costs can vary tremendously. Knowing what kind of parts are most important to your pool will tell you where the bulk of your investment should go. AZ Central provides a complete list of pool components, from handrails to lights… filters to decks. The article lists each one, ranks their importance, then recommends how much money should be spent on each. Since no pool is totally created equal, certain pool owners would do better to spend more money on certain components than others. Among the most important components of a pool is the pump. The wrong pump can be expensive to run and extremely noisy. The right pump can pay for itself with lower energy costs for you. Along with the pump, automatic levelers are necessary for keeping a pool full and leveled off. Most cost about $800 to install. The deck is another must-have component that can cost a lot of time and money to build and maintain. But it’s not a bad idea to spend a little more money on them depending on the amount of traffic you expect to have on it. If your pool gets much use, consider spending more money on a higher quality deck. One of the best decks possible are the ones that contain stone tiles. They tend to start around $4,000. The deck surface is another important pool component worth considering. When updating the surface, consider ones with acrylic lacing at about $800. They contain hints of sand, which provides the deck with a little more grip. Handrails are a good idea to have since they add safety but they a certainly not necessary. Traditional metal rails can heat up quickly. So if you can, purchase ones that are made of a reflective material instead. Even if this costs a bit more money, it is money well spent. Mostly we’ve discussed the must have items worth investing in. Now let’s talk aesthetics. Nothing says aesthetic like a pool kitchen; an unnecessary, but pleasurable addition to your outdoor environment. The prices for a pool kitchen vary immensely, costing as low as $800 but as much as $4000. Fire pits are another unnecessary, but pleasurable addition. They cost roughly $500 to $1000 install, depending on the materials and customization. Another part that is completely aesthetic is the waterline tile. They cost roughly $700 to install and often are accompanied with a resurface of the deck as well. 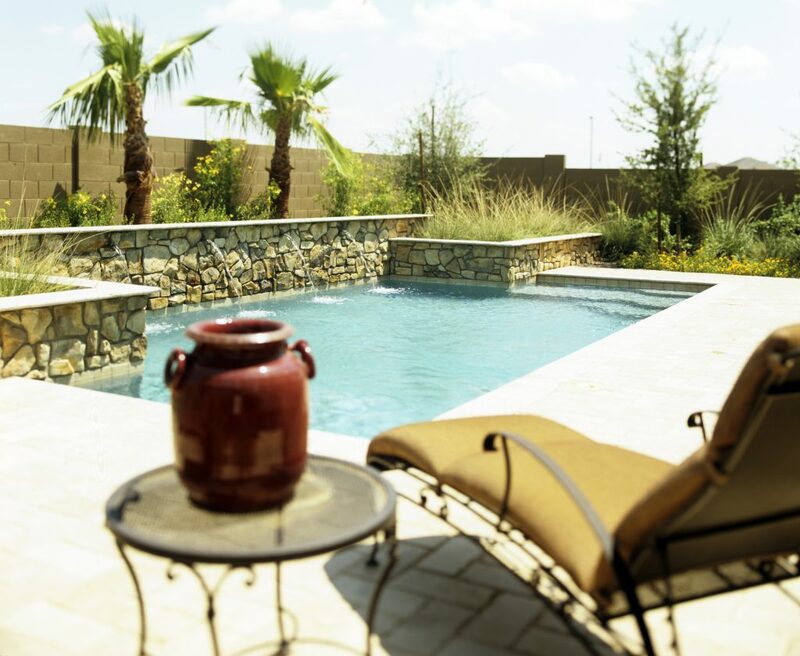 Saving money in updating a pool is quite easy once you have separated what is necessary and what is not necessary. Invest in your pump, your leveler, your pool deck, and its surface. Then see what you have leftover for anything else.